They are related to sharks and have cartilage instead of bones. They swim by undulating greatly enlarged pectoral fins. They will not sting unless you handle them or step on them. Watch your step! Where seen? Like strange 'flying' saucers with bulbous eyes and long whip-like tails, these fishes are often seen in our mangroves and coral reefs. They can sting painfully! These fishes often hide in silty bottoms and under coral ledges, watch where you step and where you put your hand. What are stingrays? Stingrays belong to the Family Dasyatidae. According to FishBase: the family has 9 genera and 70 species. Together with skates and rays, stingrays belong to the Order Rajiformes. These fishes are related to sharks but most are adapted for hunting and living on the sea bottom. They have flattened bodies with enlarged pectoral fins. Features: The largest species of stingrays can grow to 4m in diameter. Those commonly seen on our shores are much smaller. Like other rays, stingrays have greatly enlarged pectoral fins along their body edges. With graceful undulations of these fins, they seem to 'fly' through the water. They generally swim slowly, but can make a quick dash if they need to. They also flap the enlarged fins to bury themselves in the sand in an eyeblink. Stingrays have no or indistinct dorsal fins. They have long whip-like tails but lack tail fins. Their bulbous eyes stick out above the flat body, allowing them to peer out when they lie buried in the sand. Living close to the silty or sandy bottom, stingrays have a different way of taking in water to breathe. To avoid sucking in mud and sand, water is taken in from the upperside of the body through holes called spiracles. These holes are found just beside their eyes. The water is then expelled through five pairs of gill slits on the underside of the body. Rays are closely related to sharks. 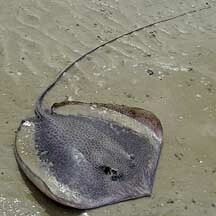 Like sharks, the skeleton of a stingray is made of flexible cartilage. If you want to know how cartilage feels like, your nose and ears are made of cartilage! The stingray's flat teeth are also made of cartilage but are strong enough to crush clam shells. This is because the teeth are stiffened and braced with struts of different types of cartilage. Most stingrays have one spine (some may have up to four spines), often near the base of the tail (where the tail joins the body). Stingrays don't sting with the tip of the tail. These spines are serrated and can cut deeply and introduce venom into the wound that can cause excruciating pain. These spines are used to protect themselves and not to hunt prey. They can replace lost spines. Sometimes mistaken for a horseshoe crab and visa versa. In murky waters, these two different animals do have a similar profile, both being round and flat with a long tail. Other similarly shaped fish include the Electric ray (Narcine sp.). Deadly ray! Stingrays are not aggressive animals and prefer to flee from danger. Most stingray injuries are the result of carelessness, generally when someone accidentally steps on a stingray that is lying harmlessly on the bottom. Stingray spines can penetrate through booties! How to stay safe: Wear covered shoes. Watch your step and walk slowly. Be aware of your steps, if you feel a movement under your foot, pull back and don't step down with your full body weight. Do not step into murky water. What do they eat? Most rays are well adapted for bottom-dwelling. Their flattened body allows them to hover close over the bottom like a vacuum cleaner. The mouth is on the underside to forage for buried bivalves, crabs and worms. These are crushed and ground up with blunt teeth. How do they hunt for prey? The snout may function as an electroreceptive organ, sensitive to electric charges of prey buried in the ground. Once they find signs of an edible titbit in the sand, they may expose the buried prey by blowing a jet of water from the mouth. They may also flap their enlarged pectoral fins to dig up large shallow holes in sand or mud. 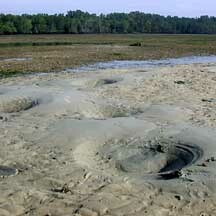 On some of our shores such as Chek Jawa, such 'craters' are often seen on the sand bar. 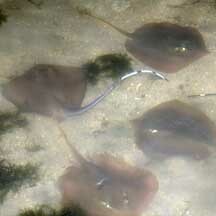 Baby rays: Stingrays practice internal fertilisation. Males have a pair of claspers near the pelvic fins with grooves to introduce the sperm into the female. Stingrays give birth to live, fully developed young. Human uses: Stingrays are a popular seafood dish in Singapore. The large pectoral fins are barbequed and served with chilli, often on a banana leaf. You can see their cartilageous bones as you eat the flesh. The Blue-spotted fantail ray (Taeniura lymma) is also popular in the live aquarium trade although it does not do well in captivity. Spiracles on the upperside behind the eyes. Mouth and gill slits on the underside. 'Craters' left behind by feeding stingrays? 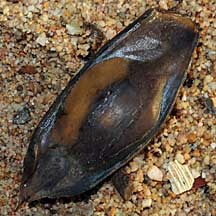 An egg case laid by a shark or a ray. This one was caught in a drif net. Family Dasyatidae (Stingrays) and Himantura bleekeri (Bleeker's whipray) and Himantura gerrardi (Sharpnose stingray) and Neotrygon kuhlii (Blue-spotted stingray) and Dasyatis pastinaca (Common stingray) and Dasyatis zugei (Pale-edged stingray) and Pastinachus sephen (Cowtail stingray) and Himantura undulata (Leopard whipray) and Himantura walga (Dwarf whipray) and Taeniura lymma (Ribbontail stingray) on FishBase: Technical fact sheet on the order, including fact sheets on individual species. Volume 3: Batoid fishes, chimaeras and bony fishes part 1 (Elopidae to Linophrynidae) FAO Species Identification Guide for Fishery Purposes The Living Marine Resources of the Western Central Pacific. First stings first on the wildfilms blog. Ria got stung by a stingray because she was careless. She kept a daily journal of how the sting developed -- it wasn't pleasant. Marcus F. C. Ng. 18 September 2015. Juvenile mangrove whip-ray at Pulau Hantu. Singapore Biodiversity Records 2015: 128. Toh Chay Hoon and Kelvin K. P. Lim. 31 Oct 2013. 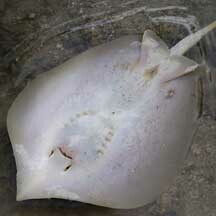 Mangrove whip-ray (Himantura granulata) at Semakau reef : a new record for Singapore. Singapore Biodiversity Records 2013: 46.